Wileyfox is a British-based smartphone company. Its phones use the customisable and secure Android-based Cyanogen operating system. Although the company is based in London, Wileyfox phones are built in China using standard industry components such as Qualcomm Snapdragon processors. 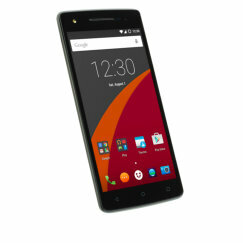 The Storm is a mid-range phone from new British smartphone maker Wileyfox. Priced for value, the Storm gives you a large 5.5 inch screen, an 8-core processor, loads of memory and a 20 megapixel camera. Unusually, the Storm runs the Android-based Cyanogen OS. It's a good all-rounder for anyone willing to take a risk and try something new. Wileyfox Swift review - The Swift is the entry-level smartphone from new British phone maker Wileyfox. Retailing for just over �100, the Swift is a nice-looking phone with features that compare favourably with rivals at this price point. Of particular note are the Android-based Cyanogen operating system, and the generous amounts of memory included.